e-Xstream introduced the first simulation chain for additive manufacturing of polymers, Digimat Additive Manufacturing (Digimat-AM). Additive manufacturing of plastics and composites is evolving from rapid prototyping to industrial production. Printer manufacturers, material suppliers, and end-users need predictive simulation tools to bring the additive manufacturing efficiency and performance to the next level required by the industry. Digimat-AM, the latest edition to the Digimat platform, is the ultimate simulation solution for manufacturing process of Fused Filament Fabrication (FFF), Fused Deposition Modeling (FDM) and Selective Laser Sintering (SLS) of reinforced materials. For printer manufacturers and end-users, the part fidelity is the top challenge to overcome. Digimat-AM allows the engineer to predict warpage and residual stresses of a polymer part as a function of the manufacturing process parameters. With Digimat-AM, users can further optimize the process and minimize the part deformation right at their fingertips. Virtual engineering is the solution to minimize printing trial and errors because it enables the user to explore the process sensitivity to manufacturing parameters. By applying multi-scale material modeling techniques to the additive manufacturing of polymers (unfilled and reinforced), Digimat’s virtual material compounding and characterization is a key enabler for customers developing new materials. Virtual engineering allows the engineer to significantly reduce physical tests, understand the key parameters driving the material’s behavior, and easily create new material systems, such as lightweight lattices. “With solutions for materials development, process simulation, and printed part performance, Digimat Additive Manufacturing is a completely innovative solution that’s fully dedicated to reinforced plastics and composites, allowing its users to ‘print it right the first time” says Roger Assaker, CEO of e-Xstream engineering, chief material strategist of MSC Software. Digimat’s latest release not only opens new horizons and a new way of designing but also brings some nice additional features. Digimat material model reverse engineering capabilities have been extended for creep and crash performances to better support material engineers. Structural engineers now benefit from significant CPU reduction when simulating the as-manufactured performance of MuCell components, or when simulating creep of plastic parts. By working together, Mazak and Muratec have developed a production system in response to the requirements of manufacturers to effectively implement the utilization of IIOT technology in their production facilities. Mazak continues to provide the most advanced and highly productive manufacturing technologies available through strategic collaborations with other key OEMs. As the result of such a collaborative effort with Murata Machinery Ltd. (Muratec), Mazak developed its new MAZATEC SMS (smart manufacturing system) that provides unmanned, lights-out manufacturing and high output, as well as Industrial Internet of Things (IIoT) connectivity. The MAZATEC SMS combines Mazak’s machining, automation, and Smart technologies with Muratec’s automated high-density storage and retrieval system. The MAZATEC SMS pairs multiple Mazak horizontal machining centers and/or multi-tasking machines with a Muratec vertically orientated, space-saving stocker-type system that has pallets, a material bucket and high-speed stocker crane. To match each manufacturer’s specific production and floor space needs, the modular system can have up to 150 stockers (in different sizes) in a six-level configuration that increases space efficiency by as much as 67%. As key components of the MAZATEC SMS, Mazak’s SmartBox IIoT technology and Smooth PMC production management software along with Muratec’s automated system control all interconnect/synchronize with a customer’s enterprise resource planning ERP/MRP host and MES execution systems. These highly advanced digital innovations and complete connectivity make the MAZATEC SMS a smart factory solution for process control, monitoring and optimization to produce a variety of workpieces – even in small lot sizes – with extremely high efficiency. The MAZATEC SMS can incorporate various sizes and types of machine tools into the same automated manufacturing system. Such flexibility is possible because the stocker system sets up faster and easier as well as accommodates different size machine tool pallets, as does the system’s single stocker crane. This capability also allows manufacturers to apply the MAZATEC SMS across a more expansive spectrum of part numbers/types for cost effectiveness and increased ROI. Peripheral equipment for the MAZATEC SMS includes individual stations for loading and centering, tilt loading, raise and lower loading, work set up and part washing. In addition to keeping the machine tools supplied with work, the system’s stocker crane handles the MAZATEC SMS overall input of raw parts and the output of finished ones. For its part of the collaboration, Muratec contributes AS/RS durability and reliability. The company and its systems are well entrenched in the automotive and other industrial manufacturing environments. Unlike other comparable systems that tend to be standard in nature, Muratec’s base units are much more customizable and configurable for a wider range of applications. Mazak has a long history in the production of factory automation systems, such as its earliest one the MAZATROL FMS (flexible manufacturing system) developed in 1984 and its current systems that include PALLETECH and the single machine MPP (multiple pallet pool). Similarly, Murata Machinery has extensive experience as a provider of material handling systems to manufacturing facilities worldwide. Image-based method for real-time property inspection of printed parts. Researchers at NASA Marshall Space Flight Center have developed a novel method for interim, in situ dimensional inspection of additively manufactured parts. Additive manufacturing processes currently have limited monitoring capabilities, offering users little to no options in mitigating the high levels of product and process failures. This technology uses both infrared (IR) and visual cameras that allow users to monitor the build in real-time and correct the process as needed to reduce the time and material wasted in parts that will not meet quality specifications. The technology is especially useful for the in-process inspection of a parts internal features (e.g., fluid channels and passages), which cannot be easily inspected once the print is complete. The technology has the potential to enable the implementation of a closed-loop feedback system, allowing systems for automatic real-time corrections. The in situ inspection technology for additive manufacturing combines different types of cameras strategically placed around the part to monitor its properties during construction. The IR cameras collect accurate temperature data to validate thermal math models, while the visual cameras obtain highly detailed data at the exact location of the laser to build accurate, as-built geometric models. Furthermore, certain adopted techniques (e.g., single to grouped pixels comparison to avoid bad/biased pixels) reduce false positive readings. NASA has developed and tested prototypes in both laser-sintered plastic and metal processes. The technology detected errors due to stray powder sparking and material layer lifts. Furthermore, the technology has the potential to detect anomalies in the property profile that are caused by errors due to stress, power density issues, incomplete melting, voids, incomplete fill, and layer lift-up. Three-dimensional models of the printed parts were reconstructed using only the collected data, which demonstrates the success and potential of the technology to provide a deeper understanding of the laser-metal interactions. By monitoring the print, layer by layer, in real-time, users can pause the process and make corrections to the build as needed, reducing material, energy, and time wasted in nonconforming parts. Chris Kaiser, president/CEO of BIG Kaiser presented a $4,100 donation to National Tooling & Machining Association’s National Robotics League. At the first general session of National Tooling & Machining Association’s (NTMA) annual meeting near Jacksonville, Florida, Chris Kaiser, president/CEO of BIG KAISER, presented a donation for $4,100 to benefit the NTMA’s National Robotics League (NRL). The donation was the result of a year-end promotion by BIG KAISER, giving back to the association a percentage of every order by an NTMA member company. Manufacturers placed their orders for cutting tools, tool holders, and workholding products and were earning funds for the NRL at the same time. “The promotion was a way for us to support our customers and members in the NTMA, and to promote workforce development and STEM programs through the National Robotics League,” Kaiser explains. The NRL is a manufacturing workforce development program of the NTMA where students design and build remote controlled robots (Bots) to face-off in a gladiator-style competition. Through the manufacturing process of Bot building, students’ imaginations are captured as they design, build and compete with their own robotic creations. Through this hands-on effort along with industry partnerships, students gain practical knowledge of Science, Technology, Engineering, and Math (STEM) – all essential skills for manufacturing. James “Jay” Campbell had no idea that when he and his brother Larry were paid pennies per unit to help their dad deburr injection-molded parts every evening during their high school years, the experience shaped their futures. With more than a decade of hands-on experience, Jay founded Campbell Engineering in Lake Forest, California, 19 years ago, but he still considers himself more machinist than CEO. He consults Larry for advice and is thrilled that his own daughters and son-in-law now work with him at Campbell Engineering. Campbell Engineering has found a niche machining parts for medical laser systems. Jay’s company has found its niche milling highly complex, low-volume components – primarily aluminum parts for medical laser instruments, developing a reputation for high quality and customer service standards while delivering parts on time. Recently, Campbell Engineering has been evolving from a job shop into more of a contract manufacturer, as current clients ramp up part quantities. Adding a Makino PS95 vertical machining center (VMC) and a51 horizontal machining center has allowed the company to expand its capacity as it shifts its business model. Campbell Engineering had used conventional VMCs for its operation, equipment that fulfilled Jay’s dream of starting his own shop and had served the company well for many years. But he knew that adding new technology would help the company grow. The company had already grown from a one-man shop to a two-shift operation, and had expanded from an 800ft2 to 11,500ft2 building. Recognizing growing pains similar to those his father’s business had once experienced, Jay spoke to his brother Larry about the Makino machining solutions they had put in place during their growth spurt. 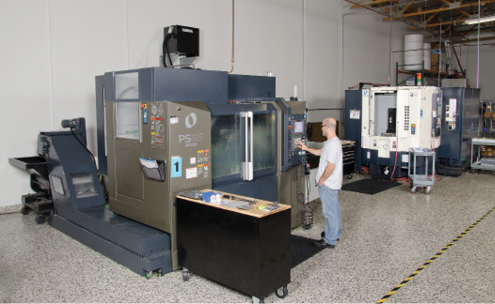 Campbell Engineering purchased a PS95 VMC in late 2013. In addition to adding new equipment, Campbell Engineering is working toward Stage 2 ISO certification. Larry Campbell challenged his brother, Campbell Engineering CEO Jay Campbell, to seek the recognition. Campbell Engineering is already seeing big improvements as it expands its capacity. The PS95 became the company’s number one workhorse for larger applications with limited operations that require high metal-removal rates (MRR) and precise true positioning. A machinist at Campbell Engineering runs parts on a Makino PS95 vertical machining center (VMC). Since upgrading from commodity VMCs, the PS95 has become the company’s workhorse for larger workpieces. On a beam splitter used for medical devices, Steve says machinists were able to drop cycle times from 42 minutes on commodity VMCs to 25 minutes on the PS95. Repeatability also improved. He adds that higher horsepower and torque allowed Campbell machinists to be 60% to 70% more aggressive with cuts, even using smaller tools. Campbell Engineering also uses the PS95 to perform high-performance roughing operations and establish datum points on the first operation. 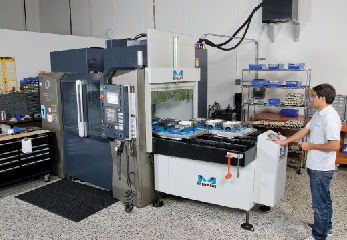 A few months after installing the VMC, the company added the Makino a51 horizontal machining center (HMC). “The HMC would help us combine operations and improve quality, since the products we are making require five-to-eight operations and a true position of 0.001",” Steve says. Campbell Engineering CEO Jay Campbell worked with Makino distributor SST to research machines. He says SST representatives analyzed the company’s goals and current position to advise on which would be the most cost-effective and efficient solution. Jay also attended trade shows to see various machines in use and researched horizontal machining centers online. SST provided the machine installations and related fixturing and consumable needs, even suggesting that Campbell add a Techni-Grip work-holding system to the a51. “SST responded to all of our questions and stayed with us until we were completely up and running. The Makino service personnel were everything you would expect from a premium machine manufacturer. We received progress updates from their technicians throughout the day during the installation process,” Jay says. He adds that when Campbell Engineering encounters applications requiring three or more operations, the a51 is its go-to solution to machine the part complete. The rigid design and high-powered spindle on the Makino PS95 have enabled Campbell to increase speeds and feedrates by 50% to 70%. One Campbell Engineering operator describes the a51 machine as a beast that is always hungry. The machine enables the company to take existing jobs and complete them using more efficient solutions. 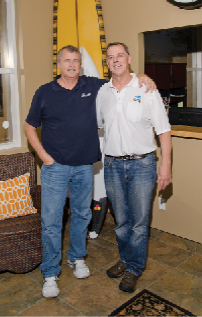 James “Jay” Campbell (left), owner and CEO of Campbell Engineering, stands with his brother, Larry Campbell, president of AFAB Precision Machining. The brothers grew up machining parts and both have remained in manufacturing. Campbell Engineering operates each machine with its individual strengths in mind, maximizing value. Between the two, the company tries to run as many jobs as it can. Being more aggressive in the cut has improved Campbell’s throughput and profitability. As the company continues to expand with more high-mix, low-volume work, it has already purchased another Makino HMC, the a51nx, as well as a Makino U6 wire EDM to give the company even more control over quality and scheduling. Campbell Engineering knows that acquiring new technology can help it maintain its competitive edge. Article originally appeared in the August 2017 issue of Today's Medical Developments magazine.